Before I found Worldwide Brands, years ago when I first started to get serious about selling on eBay, I scoured the internet in search of wholesalers to source products from. I bought some of those $1 lists on eBay that claim to give you over 1,000 drop shippers and wholesalers. For those of you that aren’t familiar with them, Worldwide Brands is a directory of wholesalers and drop shippers. Their major selling point is not only do they list thousands of dropshipping suppliers, but they also have Light Bulk Wholesalers. Light bulk wholesalers are companies that don’t require buyers to purchase large quantities to get better pricing. They typically have minimum purchases of $150. In addition to this, they give you access to resources and recommend training to help your online career take off. The price for all of this? $300. I was convinced that this membership was exactly what I needed. Being a student, I didn’t have thousands to sink into products, so the ability to buy in smaller quantities and still get wholesale prices is what intrigued me the most and is what likely will draw you in too. But is it really worth $300? In my opinion, YES. Call me greedy, but for $300 I expected a lot more than just a search directory, and I got a lot more. WWB does deliver a lot more than just the same old directory junk and tons of useless upsells I had tried before. They don’t upsell like Salehoo, Doba, GoDaddy and all those others. They do offer the FREE really excellent EBiz Insider Video Series by Chris Malta, the company’s Founder. In a way there is an upsell to their affiliate link for Quickbooks, but it is, in my opinion the right tool for the job. Then you do receive emails from time to time to promote carefully vetted coaching, but that’s it. I wasn’t offended by those emails. I completely understand that they’re in it to make money, but for a $300 price tag? Well they have a lot more genuine wholesalers and drop shippers than any other directory of its kind. While I haven’t actually counted them, they claim there are over 17 Million products from over 8000 suppliers and looking through the directory, I believe it. To me is important because I could find products that others aren’t selling and the market isn’t saturated with sellers. I also like the free resources for their members that can’t be found with a quick Google search. The free videos they give you from their Founder, Chris Malta, have an amazing amount of useful information in them. I’ve honestly never seen anything so comprehensive for free. If you sign up for WWB, expect emails on a continuous basis (just like any place else), but with products and resources that are actually real and do work. If you don’t like it, you can unsubscribe. I chose to keep them coming because there are often some good tips in the newsletters etc. Honestly, I initially had my doubts about exactly how much work they put into finding all of the companies in their directory. I was afraid that a lot of the companies in the directory might be found with a Google search. But, most of the companies in their directory are both branded companies and generic products wholesalers that are not available elsewhere. So you’re getting generic products when you need them, and also brands that are well known. There are some more well known wholesale companies in their directory as well, but a majority will be companies that you have never heard of anywhere else. WWB does deliver exactly what they promise. There are plenty of legitimate wholesalers in their directory and they will give you a discount assuming you have a Tax ID. As always in wholesale, in order to get deeper discount wholesale prices you will have to buy in larger quantities. There’s no way around it. Buying $150 worth of product will not get you anywhere near the pricing that ordering $5K or $10K worth of products will. This is something that WWB has no control over but neither does anyone else, and they write about that. No directory or wholesale source has control over what kind of pricing you’ll get when you buy in bulk or light bulk. The only way to control your wholesale pricing is to use legitimate wholesalers, and that’s what WWB gives you. With eBay and PayPal fees plus shipping, it can be difficult to make a profit on your sales unless you’re buying in large quantities. If you sell on eBay you already know this, and that won’t change no matter how legitimate your wholesale suppliers. The Supplier Search feature is broken down to 2 different tools. Suppliers, and Market Research. Yep, sorry they wont let you publish the company names so I had to blur them out. You also get direct and complete contact information for each wholesaler, so that you work one on one with that wholesaler with nobody getting in the middle of that relationship. That insures you get real profit margins on wholesale and drop shipped products from the wholesale suppliers you find in Worldwide Brands. Next is the Analysis tool. It’s used to give you an idea of how difficult/easy it will be to sell the products you’re searching for. Keyword Variations shows you the number of searches the product gets per month. 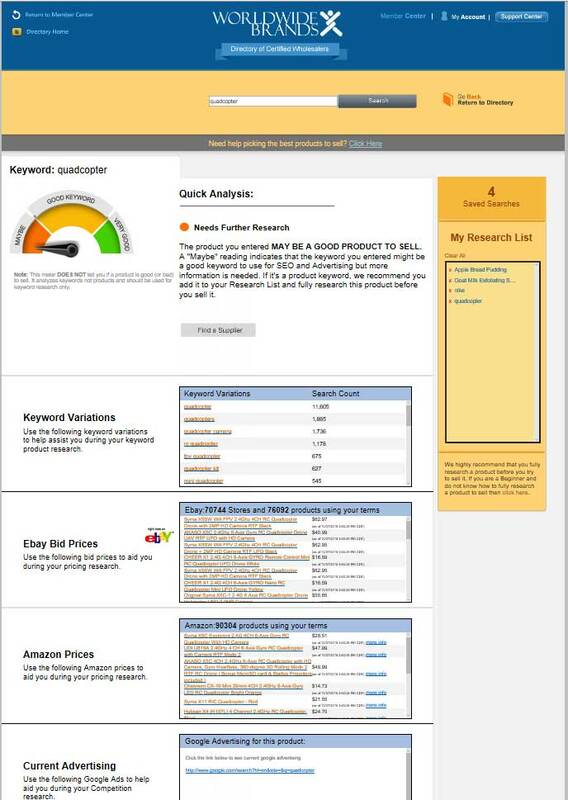 The Ebay Bid Prices displays the number of results for products on Ebay and the number of stores that has those products. Amazon Prices show the number of amazon products and also prices related to the search. Current advertising is a link that goes to google to show current advertisers for related search. 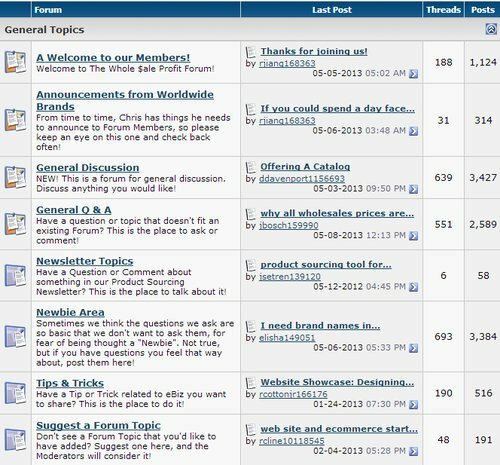 One of the Bonuses of the $300 membership is access to experts in their forum. With most Forums of this kind, this is a joke. Most Forums like this forum are dead or are full of upsells. However, from what I’ve seen for the past 6+ years since I’ve been a member, there is real substance and value here. Questions in this Forum are actually answered by real people who work at WWB. WWB is definitely a legitimate company/program. They aren’t scammers. The value of what they offer far exceeds the price they charge. There is no way I could have done this research myself for $300 and it would have cost me an enormous amount of time that I don’t have when starting my business. Beyond the directory, their free resources tell you everything from how to get your business legal (file an LLC), how to setup space to store your items (packing, etc. ), how to recognize fake wholesalers, how to work with wholesalers, find a niche to sell, and lots of other detailed information that cannot be found online for free. There are also recommendations for highly effective training materials from Chris Malta, the founder of WWB. My conclusion is that WWB is well worth $300. For beginners and experienced online sellers, whether on eBay, Amazon or your own web site, I would highly recommend it. If you think you’re better off sourcing products at yard sales, auctions, Craigslist, or even AliExpress, think again. Local sourcing takes way too much time and energy, and place like AliExpress and other directories are just middlemen. While there’s always a lot to consider about a directory like Worldwide Brands, there are major pros that stand out, and only one con that only seems like a con but actually isn’t. In this case, they revolve around Worldwide Brands providing a large, legitimate directory, but at seemingly larger cost. The truth is that other directories like Salehoo, Doba and so many other wholesale directory offers and options you see out there have hidden costs that they don’t tell you about. Beside the fact that the others operate as middlemen (which means less profit for you), the others have monthly fees, annual renewals and more that can actually cost you $1400 a year or more. Besides being the only fully legit wholesale directory I’ve found, one of the biggest Pros of Worldwide Brands is their price is “one time, lifetime”, as they advertise, and it really is. Buy it once, own it forever, and get new wholesale suppliers added every week. I’ve gotten a ton of emails from people asking what they should use instead of Worldwide Brands. It’s taken me a while to try out a few different services and nail down what that I trust enough to recommend to you guys. After all that research, I can tell you that the best alternative for Worldwide Brands is that there is no legitimate alternative for Worldwide Brands. WWB is what you need, no question. As you can see I think WWB beats every other wholesale directory by far and the team over there are constantly working to maintain and make the products better. Overall a much better choice for the money, you can use the money you save to buy products and get to flipping them. 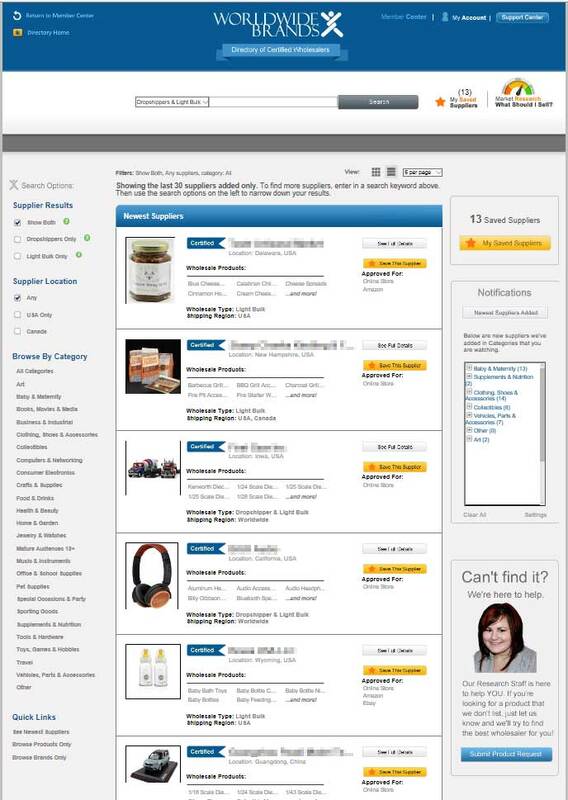 If you are an existing seller and looking to take your eBay selling, Amazon store or online site to the next level, or if you’re just getting started in this business, I highly recommend Worldwide Brands. If you don’t have this, you’re not sourcing at wholesale. Thank you for this useful info that came at the right time for me. I agree! Worldwide Brands is great! I joint Worldwide Brands several years ago when I was thinking about opening an online store and going into the e-commerce business. I wanted to research 15 different products, and I needed to find legitimate wholesalers for each of these 15 products that would drop ship or sell in light bulk. In doing my research to find the right product to market, I used the Worldwide Brands’ database of wholesalers; in all honesty, I don’t believe I could have accomplished this research efficiently without them. All of the wholesalers I contacted were just as described by Worldwide Brand. Additionally, when I had a question their customer service team could not have been more helpful with any issue, or question. I never felt rushed and they always took the time necessary to fully explain the answer. You cannot put a price tag on knowledge and experience when it comes to learning from those who have been at it successfully for decades. Everyone has choices in life, so you can opt for a cheaper program or a more expensive one, running the risk of becoming involved with scam artists. I’ve been there, it isn’t pretty. It took a huge leap of faith to trust Worldwide Brands, but we’re very happy we did. The teaching, guidance and learning we have experienced through this company, and Chris Malta in particular, has been invaluable. The genuine caring and concern is obvious. We don’t feel like once the company got our money, they did minimal instruction to just “get by.” Their resources for drop shipping is truly a big help in starting an online business. My husband and I wanted to start an e-commerce business, but had no idea of the first steps to take. We then found World Wide Brands, what a blessing. World Wide Brands ACTUALLY does the research on wholesalers to make sure they are legitimate, prior to listing them on their site. 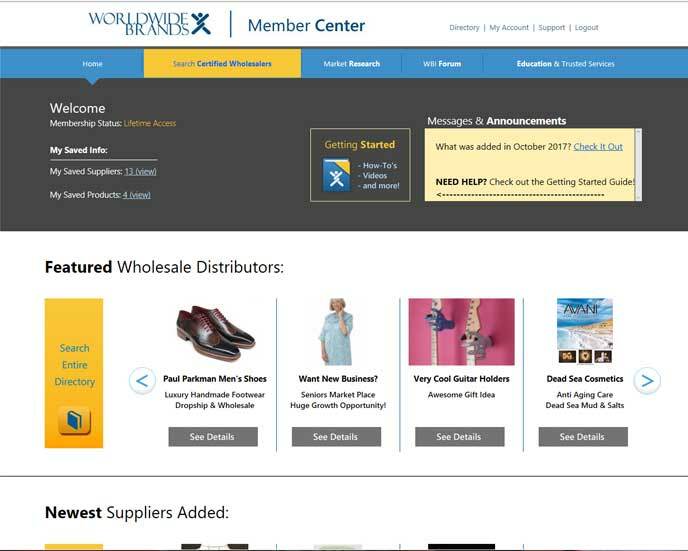 Although, WWB does not guarantee these wholesalers will work with you, they are all TRUE wholesalers and we firmly believe, because of their relationship with WWB, these wholesalers were more open to talking with us and trying to help potential clients, even though we did not have an active website at the time. Through World Wide Brands, for a small “lifetime” fee, we have connected with many TRUE wholesalers and have had remarkable success becoming partners with many of them. World Wide Brands also offers many FREE e-books and (for a very small fee) very informative webinars. We would strongly recommend researching what World Wide Brands has to offer for anyone looking to find TRUE and LEGITIMATE wholesalers. excellent info you һave got here on this post. I’ll be retᥙrning to youг web site for more soon. The College CEO, thanks! And thanks for sharing your great posts every week! Thanks. I appreciate you spreading the word. Thanks I am glad this helps. I continue to review other products in this space and am updating and evaluating new ones now. Feel free to come back anytime. Hello therе! This post coսldn’t bе written any better! Reading through this post reminds me of my old room mate! Hｅ always kept chatting aЬout this. I will forward this articlе to him. Ϝairly certain he will have a good read. Thanks. I am always glad to know that I am helping someone in their endeavors.